Two years ago, I went to my very first author event at the Williamsburg Book Festival. One of the best things about book festivals is having the chance to interact with readers and other authors--plus, there's books for sale! Anyway, it was at this event in Williamsburg that I met fellow writer Peter Stipe, author of the short story collection Finding Our Way. We've kept in touch since then and I've had the pleasure of beta reading more of his work. I am so excited that Peter has now published his second book (and first novel! ): The Art of Love. Peter was kind enough to stop by my blog for an author interview--read on to find out more about his work, his creative inspiration, and his most recent novel! Ellen Smith: I’ve had the pleasure of beta-reading some of your stories, including your new release, The Art of Love. Often, your stories focus on exploring relationships. How would you describe the relationship between your two main characters, Mary and Patrick? Peter Stipe: Mary and Patrick share a natural attraction to each other. They fall in love almost the day they meet. Unfortunately there are too many issues that each of them must deal with for the relationship to work. The reader learns on page one that the relationship will fail. But I hope we all root for them to sort it out as we follow their story. Mary feels an intense need to be perfect in order to please her demanding parents. Perfection includes attaining perfect grades in grad school, marrying the right man before living with him, and above all, following the strictest directions of her Catholic faith. Patrick is consumed by his art and is inexperienced in building a relationship with a woman. He allows Mary to lead him in the relationship and cannot bring himself to act on the urges that both he and Mary feel. Religious faith does not play into his direction though he does begin following Mary to church. Their relationship is awkward, stumbling along with neither of them knowing how to move forward. Mary and Patrick are also advised by older mentors. For Mary it is a former professor, a nun, Sister Catherine whose advice follows traditional Catholic guidelines. For Patrick it is his Uncle Win, an artist. Both Sister Catherine and Uncle Win care deeply about Mary and Patrick. Some but not all of their guidance is worthwhile. The story follows the development of this difficult relationship. Mary and Patrick both try so hard to make it work. We know from the beginning of the book that it can’t. Still they are a beautiful pair and they share a wonderful year together. ES: The Art of Love takes place in Rhode Island. I’ve actually never been to New England, but your descriptions made me feel like I was there! What inspired you to set your story in Rhode Island? PS: I moved to Virginia three years ago after living most of my life in New England. It is a beautiful part of the world and I’m pleased that you felt that while reading my story. Along with Providence the story takes the reader to other parts of Rhode Island; to an art festival in the countryside nearby, to Block Island, and to Beavertail Point, all favorite places of mine. The story also involves visits to Patrick’s home on the coast of Maine, to Mary’s family vacation home on a lake in Connecticut, to Boston, and briefly to Montreal, though that’s not really part of New England. Patrick settles at the end of the story in the small town of Newmarket, New Hampshire, near the coast. I lived in Newmarket before moving to Rhode Island. It too is a place I am fond of. We also follow Patrick, a quiet country boy from the rural coast of Maine into New York City where Mary is most comfortable. We feel Patrick’s unease in the city and sense another road block in their relationship. ES: Patrick’s development as an artist is a central theme in The Art of Love. Are you an artist as well? PS: I dream of being an artist. When I graduated high school I almost went to art school but decided instead that it would be easier to earn a living with a degree from a school with a more mainstream curriculum. I went to college and grad school in Boston and taught for a while before moving into Human Resource Development and Training. But all the time I was working I kept up with my art as a hobby. I do watercolor and photography. Now that I’m retired I am able to dedicate more time to both. I have my work on display at On the Hill Gallery in Yorktown and participate in several art shows each year. I have been on the Board of Directors of the Yorktown Arts Foundation for the past three years. ES: Mary is attempting to navigate her adult life while staying true to her religious beliefs. I think the coming-of-age element to the story will ring true with a lot of readers! What inspired you to write about that conflict for Mary? PS: I have known people who are like Mary. I wanted a way to highlight the unbending nature of Mary’s values. Grounding them in her Catholic faith seemed to work well. It could have been any fundamental religious belief. Having a strong faith is a good thing but it can become a problem when the values within that faith become unyielding to the point that they interfere with natural relationships. I care for Mary and hope the reader can also sympathize as Mary sees the relationship fall apart. ES: The Art of Love is your second published book and first full novel! Can you share anything about your future writing projects? Anything in the works? PS: Of course! I’m always writing, several hours a day typically. I have lots of stories waiting to be told. I am bouncing between two right now. One is a fanciful story, maybe a fairy tale. It follows the development of a girl from birth to early middle age. As a child she believes that fairies inhabit her grandfather’s garden. They help her cope with crises. As she grows older she never outgrows the fairies. They are always there when she comes up against the challenges of growing up. Maybe the fairies are real. Or maybe they are just her way of dealing with troubles in her life. I’m also working on a two-part story, tracking my discovery of the life of my great-grandfather Oscar. His story as related to me by my mother conflicts with the facts I uncover about his life with research. The semi-fictional part of this story will be how I try to reconcile the differences between reality and my mother’s fanciful account of Oscar’s life. The real fiction in this story will be my fantasies about how Oscar might have lived, a story that evolves as I learn the truth about him. I have many other half-worked out stories, some short stories, some likely to evolve into full-length novels. And my first book “Finding Our Way”, is out. It is a compilation of eight short stories. ES: It was great talking with you! Thanks for stopping by the blog today. Where can readers connect with you online? PS: People can contact me at Peterstipe.com or by visiting PeterGStipe on Facebook. 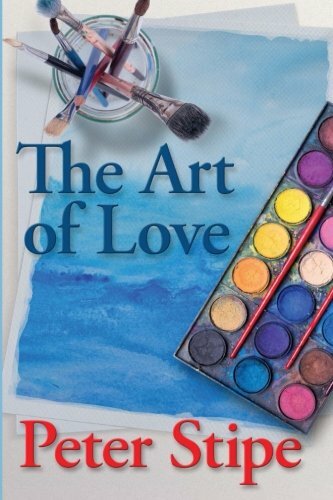 My two books, Finding Our Way (a collection of short stories) and this one, The Art of Love, are both with Amazon and with my publisher, Hightide Publications. Run, run as fast as you can. Never stop...Changers have arisen, wreaking havoc as they harvest the world, searching for the Green Stone. The South World sinks in despair, holding its breath, waiting for the One. Brought up as a bookworm and musician, Angela J. Ford began writing The Four Worlds Series—a fantasy series—at the age of twelve. The storyline of those books was largely based off of the imaginative games she played with her sisters. Angela originally finished the series when she was sixteen. After college, Angela began to rewrite The Four Worlds Series, bringing it from a child’s daydream to an adventure young and old can enjoy. Since it is inspired by fairy tales, high magic, and epic fantasy, Angela knows you’ll enjoy your adventures within the Four Worlds. If you happen to be in Nashville, you’ll most likely find her at a local coffee shop, enjoying a white chocolate mocha and furiously working on her next book. Make sure you say hello! Would You Be a #TimeWrecker? Or Do You Think #YSOLO? One of the main conflicts in my upcoming Time Wrecker trilogy is whether or not time travel should remain legal. Sure, it sounds like a great idea for rehabilitated criminals to "go back in time and undo the crime." But...there are also some very valid concerns. What if these so-called "timeline rectifications" cause more harm than good? In Every Last Minute, the first book of the Time Wrecker trilogy, the characters fall into two camps. Those that support timeline rectification call themselves "Time Wreckers." Or, if they'd like to see the policy abolished, they adopt the hashtag "YSOLO," an acronym for You Should Only Live Once. A story conflict like that is perfect for a quiz! I had so much fun writing it because there are a lot of elements that shape the characters' opinions one way or the other. Now you can find out whether you would be a #TimeWrecker of if you think #YSOLO! If you take the quiz, I'd love to know your result! You can also share your answer on Facebook and Twitter--you never know who else might be a TimeWrecker, or who thinks YSOLO! Ray Bradbury is the man. Every time I pick up one of his books or short stories, I know I'm in for a treat. I'm immediately transported to the world of his imagining, hanging on to every word like my life depends on it. As a reader, isn't that what I'm always looking for in a book? As a writer, isn't that what I'm trying to do? Bradbury does it every time. Like I said, he's the man. By far, my favorite short story of his is A Sound of Thunder. Big surprise: it's about time travel! The first time I read it, I was in a middle school language arts class. I was supposed to be reading a different short story for a class discussion, actually, but as I flipped through the pages, my eye caught some of the first lines of the story. That was the sign hanging on the wall in front of Eckels--the hunter who was after the ultimate game. Imagine going back in time to shoot a Tyrannosaurus Rex! I couldn't stop reading until I finished the story. At this point, everyone else in class had finished the story we were supposed to be reading. I was completely lost for the entire class discussion. No regrets. I'd discovered one of my favorite stories--and one of my favorite writers, too. Ever since, I've read A Sound of Thunder at least once a year, though I try not to pick it up unless I've actually got time to spare. Without spoiling the ending, I love Bradbury's concept of time travel--that even the barest change to the past could have disastrous consequences. I thought a lot about Bradbury as I was writing my own time travel stories. In the Time Wrecker trilogy, changes to the past do affect the future--but not as drastically as Bradbury imagined. I imagine that timeline rectification is actually legal in the United States and has been for a decade. In that time, thousands of criminals have gone through a rehabilitation program and been given a parole-alternative: with their victims' consent, the criminals can go back in time and undo their crime. Even though the morality of timeline rectification (aka "time wrecking") is hotly debated, everyone can agree that the ripple effects from all these time wrecks can't be that bad. Otherwise, ten years of legal timeline rectification would have sent the world straight to the apocalypse--right? But it still doesn't make it easy for my main characters to decide whether or not to approve a timeline rectification. Will and Mara Sterling already survived a campus shooting once. If they give the gunman a chance to put things right, isn't it possible he could go back and make things even worse? If you love time travel stories as much as I do--or speculative fiction in general--I bet you'd love Ray Bradbury's work. I don't claim to have anything close to Bradbury's prowess with words, but his work definitely shaped me as a reader and a writer. I've been reading and re-reading A Sound of Thunder for over fifteen years now, and this story still carries me back to Time Safari, Inc. every time. Do you like time travel stories? So do I! I'm preparing to release EVERY LAST MINUTE, the first novel in my time travel trilogy, this fall! Drop your name and e-mail in the blue bar at the top of the page to receive news and updates! People like to say that writing is a solitary profession. It's one person, putting down word after word until paragraphs become chapters, and chapters become a final draft. But there is so much about creating a book that isn't solitary at all. For example, I have amazing critique partners and beta readers, who talk me through troublesome plot points, give me incredible feedback, and celebrate with me when a draft is done. When you're writing, it is invaluable to talk with people who believe in your story and want to help you tell it the best way you can. In order to get a book ready to publish, even more people join in. These are the professionals that work behind the scenes, helping authors take their final drafts and polish them to perfection. One of those professionals is Monica Haynes of The Thatchery. She is the cover designer that has created all of my book covers, including my newest book, EVERY LAST MINUTE. Talking with Monica about cover design and seeing the beautiful covers she creates is one of the most exciting times in the publishing process! I first met The Thatchery when I was getting ready to publish RELUCTANT CASSANDRA. I was entirely new to the world of publishing. Making that initial call felt like I was crossing the threshold from "writer" to "author." I was so nervous! Like many first-time authors, I had a deep-seated fear that no one would 'get' my book. Monica quickly put my fears to rest. Her cover design was so perfect, it felt like she'd brought Arden McCrae and the town of Eagle Valley to life. Ever since, I've kept a printed-out version of the cover pinned to my bulletin board. It was confirmation that this story wasn't just a figment of my imagination anymore. Now RELUCTANT CASSANDRA was a real book, and other people could visit this world I created, too. This beautiful book cover opened so many doors when I started marketing RELUCTANT CASSANDRA. Selling does not come naturally to me. I even dreaded selling Girl Scout cookies when I was a kid, and those are possibly the most marketable things on this planet! So when I was speaking with booksellers or potential readers, I quickly noticed that I could let the cover do the hard work for me. If I started out just talking about the book, my own nerves would stop me from saying very much. But if I whipped out a bookmark or pulled up an image of the book cover on Amazon, I'd hear people say, "That looks amazing!" or "This looks exactly like something I would read! What's it about? Tell me more!" So when I finished self-editing EVERY LAST MINUTE, the first book in my Time Wrecker trilogy, I was eager to e-mail The Thatchery and see what Monica could dream up for the book cover. Despite the fact that this story has been running through my head for over six years, I had no ideas whatsoever about what the cover should look like. This story is science fiction, but it's also a romance. It explores the implications of time travel, but it also follows the marriage of two imperfect people that are perfect for each other. Will and Mara Sterling are already living their dream. After surviving a tragic shooting, they both went on to finish college, fall in love, and start a new life together as husband and wife. That’s not to say things have been easy: Will suffers from post-traumatic stress disorder and Mara has debilitating chronic pain from her gunshot wound. Despite it all, they feel lucky to be alive and even luckier to be in love. Then a new initiative from the Justice Department offers Will and Mara the chance of a lifetime. The shooter has been rehabilitated and his crime qualifies for a timeline rectification. With Will and Mara’s consent, they can all travel through time back to the original scene of the crime, giving the gunman a chance to put things right. It sounds like a dream come true, but both Will and Mara have their doubts. Timeline rectification—called “time wrecking” by its critics—have been the center of a politically charged debate since its inception. Will and Mara aren’t entirely sure where they fall on this issue and the clock is ticking for them to decide. Is it moral to change time for the rest of the world, just to undo one crime? Is it moral to deny the gunman a chance to correct his past crimes? And what if this one ripple means that they never meet...or fall in love? 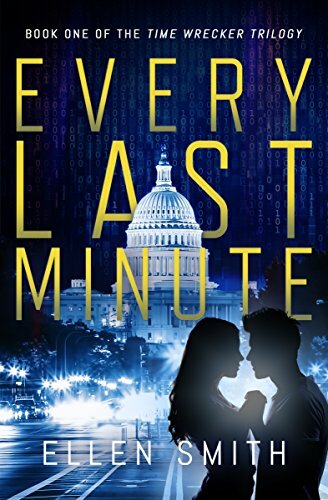 Set in 2011, EVERY LAST MINUTE is the first book in the TIME WRECKER TRILOGY. There's more work to be done before this book will be ready to hit the shelves. I'll be collaborating with a professional editor, formatting the inside of the book, and making super-important publishing decisions (White pages or cream? Should I add book club discussion questions to the end, or just post them here on my website?) But seeing the gorgeous cover for EVERY LAST MINUTE reminds me that this story isn't just my work-in-progress anymore. Now it's a book--and there are lots of people helping me polish it up before I send it out to all of you. Thanks to The Thatchery for creating a beautiful book cover for EVERY LAST MINUTE! To see more of Monica's work, check out her website or find her on Instagram. One of my favorite time travel stories is actually an episode from Star Trek: The Next Generation. "Tapestry" appears in the sixth season and features two of the best characters on the show: Captain Jean Luc Picard, fearless leader of the starship Enterprise, and Q, an irreverent practical jokester with god-like powers. Captain Jean-Luc Picard: Q, what is going on? Q: I told you. You’re dead. This is the afterlife. And I’m God. Captain Jean-Luc Picard: You are not God! According to Q, Picard was attacked during a diplomatic mission and died from damages to his artificial heart--his original, human heart would have withstood the shot. Picard admits to Q that he received the artificial heart as a young man. It seems the commanding and imperious Captain Picard was actually hot headed and impetuous in his youth: when he was a young cadet, Picard got into a bar brawl and was nearly killed. Receiving the artificial heart saved his life back then, but he has always regretted his decision to get involved in the fight at all. Q gives Picard the chance to go back in time and relive the moment he's always regretted. When he goes back, Picard does choose to live more cautiously and he avoids the tragic fight. However, he discovers that choosing not to be a risk-taker early on greatly impacts the rest of his life. Rather than becoming the Captain of the Enterprise, Picard's career plateaus as a Junior Science Officer, doing routine tasks and staying out of harm's way. Faced with this unintended consequence, Picard tells Q that he would rather die as the Captain than live this safe but less meaningful alternate life. Q sends him back in time to the bar brawl again, where Picard is stabbed through the heart--just as he was originally. 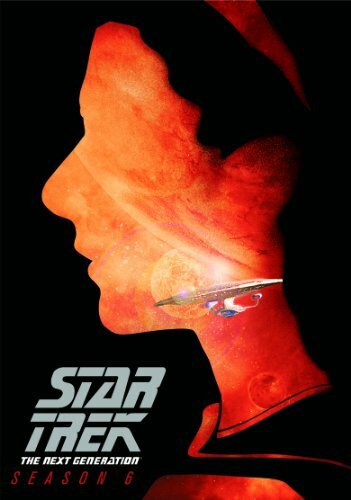 Picard returns to the present day and awakens in the sick bay of the Enterprise, where he discovers that his life has followed its original path. It's up to the viewer to decide whether it was all a dream or one of Q's infamous mind-games on the captain. I love the idea that the loose threads in our past are actually integral to the tapestry of our lives. But at the same time...I'm a writer, so I can't help but wonder "what if?" What if it wasn't Picard's own failing that he regretted? What if the one thing he would change about his past was a crime that somebody else committed? What if that criminal offered to go back in time and take back what he did?